The slow cooker has always been a great way to make a family meal and it's especially convenient for stews, pot roasts, and main dishes. It might not be your first choice for some vegetable dishes, but it's an excellent method for many sauces, bean dishes, dressings, and side dish vegetable casseroles It can even be used to roast beets or potatoes and cook whole spaghetti squash. When cooking layered dishes with root vegetables, such as potatoes, onions, carrots, turnips, and rutabagas, place them on the bottom of the cooker. Add meat or other vegetables next and the liquids last. Be sure to cut or slice vegetables uniformly so they will cook evenly. Cut most vegetables into bite-size pieces unless otherwise instructed. When cooking peeled potatoes, cover with cooking liquid to prevent darkening (unless otherwise instructed). This isn't necessary if potatoes are part of a stew or layered under a pot roast. Frozen hash browns should be thawed before cooking. Tender vegetables, such as peas, broccoli, and cauliflower should be added during the last 30 minutes to 1 hour of cooking. If they cook for too long, they will turn into mush. Frozen vegetables generally take less cooking time, but since they can significantly decrease the temperature of the slow cooker contents, they should be thawed first. Add thawed frozen vegetables to dishes during the last 15 to 30 minutes of cooking. If your crock pot has a saute feature, this can be helpful for cooking both meat and vegetables prior to the slow cooker. The saute feature can sear the meat to lock in moisture and flavor prior to slow cooking. Most slow cooker recipes are adaptable between the high and low settings. A safe bet is to half the time if you use the high setting but the recipe calls for the low setting. Avoid the temptation to constantly open the lid to the crock pot to check on the cooking. Each time you remove the lid, you remove a lot of the built-up heat and moisture. A quick check every once in a while is okay, but resist if you can. 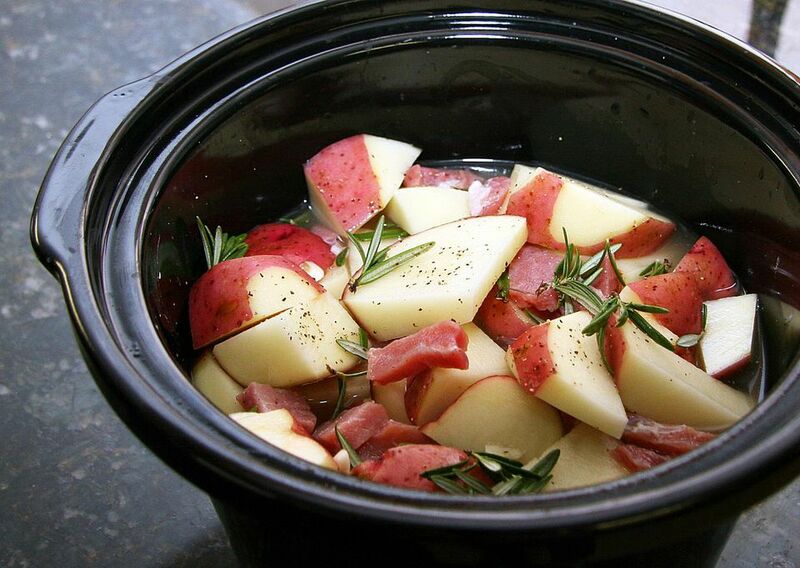 Use the warming setting if you are serving your crockpot dish for a party. It will keep the food warm without actually cooking it. Also, most crock pots will automatically switch to the warming setting after the timed cooking portion is done. The warming setting can be useful for serving any food (made in the crockpot or not) to a large crowd or over a longer period of time. The even temperature will not cook the food but will maintain a level temperature. The crock pot is a useful tool and can make a wide variety of dishes, including asparagus casserole, baked potatoes, stuffed peppers with rice, black beans, and salsa, and slow cooker bolognese sauce. Check out an even bigger and comprehensive listing of crockpot recipes for more ideas and inspiration.